Is there a hidden reason why your house isn’t selling? There are many reasons why your house may not be selling: it could be the fault of your estate agent, a lack of market activity or maybe your house isn’t presented as well as it might be. 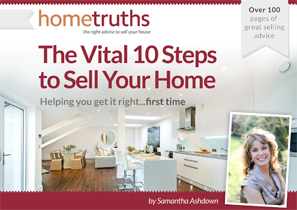 These are all practical issues, and ones which we at HomeTruths help sellers to solve, every day. However, there are other issues, which are much harder to spot. Maybe, for example, one party doesn’t actually want to sell. If the husband is very attached to the lovely family home that he has enjoyed for a decade or two, he may be rather hoping it WON’T sell. In fairness to him, he may not even realize that he is sabotaging the sale; perhaps by not remembering to tidy up after himself, might not pass on messages from the estate agent, or maybe he’ll decide to cook a curry the night before a viewing. This may be totally subconscious, of course, but no less effective at deterring a potential buyer for that. Divorces are also very efficient at putting buyers off; even if the agent doesn’t know, or has been sworn to secrecy, somehow a buyer can sense the disharmony. It may be the physical signs: the separate bedrooms, the conflicting styles, the piles of paperwork; or there may be less tangible clues: muttered remarks, pregnant pauses, the odd sniff perhaps. There’s something about the atmosphere in a house being sold by about-to-be-divorced couples that is just plain sad. If you’re trying to sell and it’s just not happening, maybe it’s time to have a big clear-out – not just literally, but emotionally – to make sure nothing is consciously, or unconsciously, sabotaging your sale.